The Best Dog Sled Tour Alaska can Offer! Many of our guests who visit Fairbanks and Chena Hot Spring Resort discover our Lead Dog Sled Tour is the highlight of their visit to Alaska. 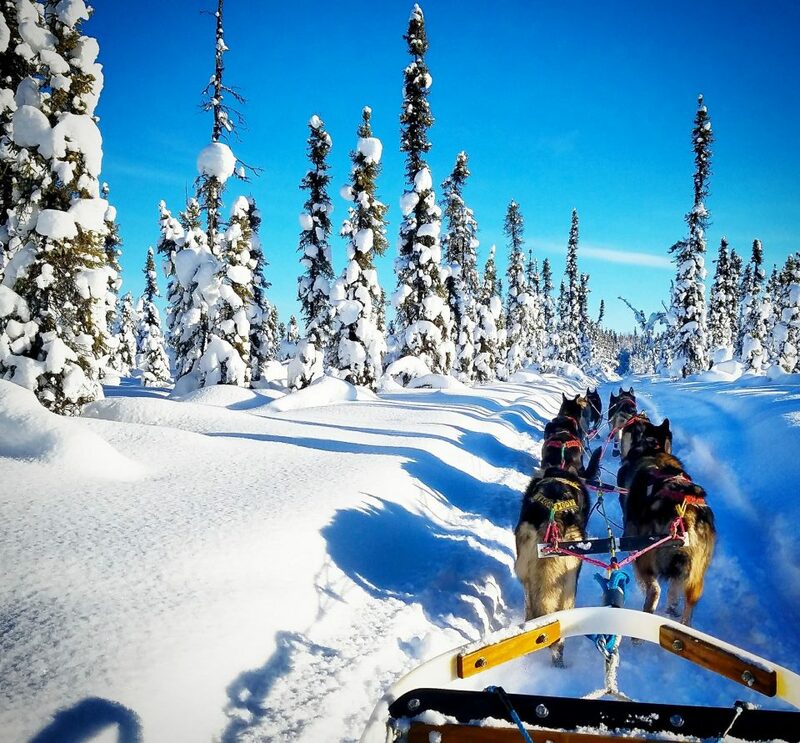 This hour long dog sled ride traverses about seven miles of beautiful forested trails, including part of the Yukon Quest International Sled Dog Race trail. Gliding along in a sled behind a team of Alaskan Huskies guided by an experience dog musher is an unforgettable experience. Guests Say our Alaska Dog Sled Tour IS Magic! This could be addicting. My wife and I went for a ride yesterday afternoon and it was magical. If I lived up here a would be buying a sled and assembling a team for recreation. A must try on your visit to the Fairbanks area. Eleanor genuinely loves her dogs and considers them family. Don’t pass this opportunity. My Alaska vacation was full of great times, but the best, hands down, was the dog sledding ride! Our musher was friendly and great with the dogs. The trail was incredibly beautiful. And the dogs were wonderful. After we stopped we were able to visit and pet the dogs– they were so friendly! Not short of magic, but magical!!! Beautiful dog sled ride thru the Boreal Forest outside Fairbanks, Alaska. We enjoyed the 7 mile Yukon Quest trail’s gorgeous scenery. The dogs were friendly and fun to pet. An adventure for all ages. The owner and staff make sure you’re dressed warm enough supplying winter gear if needed (no charge). I highly recommend this activity and dog sledding company. Don’t miss this adventure. It was a whole lot fun. My family and I had a wonderful experience from transportation arrangement, accomodating staff up to dog mushing. The scenery while on the sled ride was truly magical. Everything was awesome. An amazing experience we’d never forget. Scratch “dog sled ride” off the ole “bucket list”! My wife and I had a wonderful experience here. The dogs were very friendly and obviously VERY well taken care of. The trail though the spruce and white birch forest was absolutely beautiful, even at 25 below zero. Who knew you could have so much fun when it was so cold! (We are from Southern California, where we say its “freezing” when the temperature dip into the 50’s!). Our experience was NOTHING SHORT OF MAGIC! !